Happy New Year and welcome to the start of the Spring term in Big Dragons! All of the children had a fabulous first term and have settled in really well to the routines of full time school. We regularly get lots of recognition for how quietly and smartly we move around the school on our way to Collective Worship and PE, which is a credit to the children and their determination to set the best example right from the start of their time at school. As we move into possibly even colder weather through January and February, please make sure your child has a jumper/cardigan and a warm coat every day in school. We learn outside all the time so it is important that the children are wrapped up. Please send wellington boots for your child to wear in the woodland area but they must also have a pair of school shoes everyday so we keep the school building mud free! Our PE day is now a TUESDAY and your child will need a full, named kit every week. Please make sure EVERYTHING is named, that includes all the clothes that they take off. We had several issues with lost shoes last term and it was very difficult to work out what had happened as children have the same style and no names. Please help us to keep your child’s property with them, not lost! This term our theme is ADVENTURE! We will be finding out what an adventure is, what it might involve, how it might make us feel and what we might need to have with us. Once we know that, we will be going on some adventures! We have started our adventure work with the stories about Percy the Park keeper and all of the woodland animals he is friends with. Our first book is ‘One Snowy Night’ and we have been finding out what an adventure it would be to be lost on a dark, snowy night! We will be finding out about woodland animals habitats and what they do to keep themselves warm in the Winter. Our adventures will then move onto the classic story of ‘We’re Going On a Bear Hunt’, as we explore the area around us and the different features we have such as rivers, woods and meadows. We will be going on bear hunts and hopefully have an adventure or two along the way. As part of this work we will begin our Eco-Project on wild meadows and the importance of bees, linking our work with the Lincolnshire Wildlife Trust. As we approach half term, our work will move the The Gruffalo and we will explore the different characters and create maps to help them on their adventures. Each day we have a Phonics and Number lesson. It is very important at this stage for your child to rehearse these skills at home, so please listen to your child read to you at home as much as possible. Just 5 minutes a day is so much more beneficial than 30 minutes once a week. Our bedtime bear, Betty, has been on some sleepovers as she enjoys reading so hopefully your child will have a visit from her soon! Please speak to us at the end of the school day if you have any concerns at all, we are more than happy to help. Mrs Sault, Miss Page, Miss Goodall and Miss Hanson. Welcome to Big Dragons! We are really looking forward to getting to know our new children and support those children that were in Little Dragons as they move to full time school. During this first half term we will spend time settling the children into the routines of full time school, such as attending Collective Worship in the hall. The children will soon become used to the expectations within the classroom and the school but if you have any worries about them settling in then please have a chat with us. We spend a lot of time outside so please make sure your child has a coat in school and as the weather turns cooler they may need a hat and gloves. All children wear plimsolls inside school and it would be a great help if all the children had their own pair of wellington boots to keep in their locker for using in the mud patch and woodland. Our PE day is a Monday so your child will need a full, NAMED kit each week. Please make sure you name the clothes that they will be taking off too! This half term our theme is GREEN! 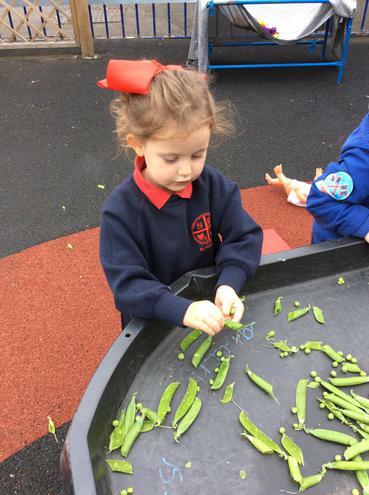 We will be investigating all things green and have already had good fun exploring peas! Over the coming weeks we will be sharing the story of 'The Princess and the Pea' and exploring why the princesses can't feel the pea, as well as changing our role play area to a Royal Kitchen to cook up a selection of green flavoured recipes! We will then look at a story called 'Colin and Lee, Carrot and Pea' which explores the idea of differences and how to develop friendships. The children will be looking at differences and similarities between themselves and others and understanding how to treat everyone the same. Our role play area will change into a supermarket as we look at the story of 'Supertato' and his nemesis, Evil Pea!! We are hoping to visit one of the local supermarkets and help the children to understand where our food comes from as we move towards Harvest.